"Miser" redirects here. For other uses, see Winter Miser Charm. The Miser Mouse is an Event Mouse found during the annual Great Winter Hunt event. The big, bad corporate backer behind this Ice castle escapade. His endless coffers of Ice Coins providing the main funding for this frosty expedition! Looking to expand his empire, he has set his eyes on that empty, vacant lot. Furious at how it has been wasted, year after year on "fun" and "sharing holiday spirit", Humbug! All that profit and prime land that has been sitting there too long! A Winter Miser charm filled with cold, hard Ice Coins like his cold, hard heart will be required to attract this mouse. Information on how to locate and capture the Miser Mouse can be found on the current Great Winter Hunt location page. 9 December 2014: The Miser Mouse was released as part of the Great Winter Hunt 2014 event, but could not be attracted yet. 18 December 2014: Using Winter Miser charms obtained from a Feedback Friday link, hunters had a chance at attracting a Miser Mouse prior to the general release. 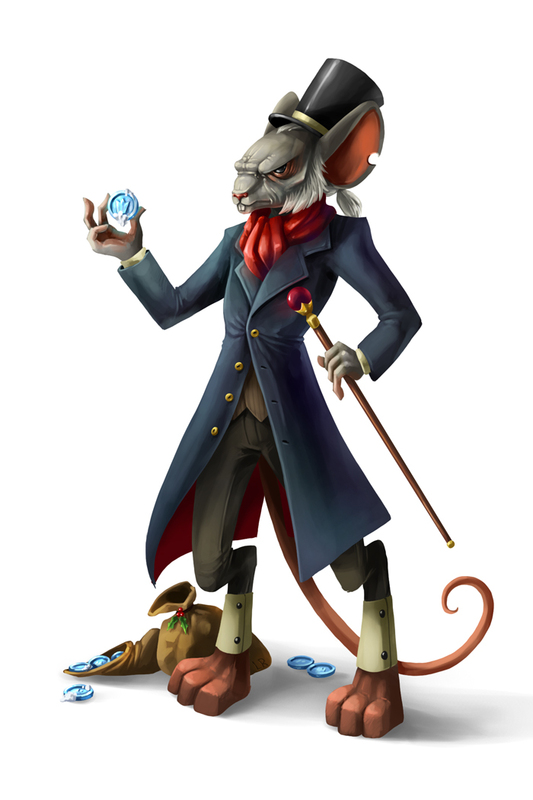 22 December 2014: The Miser Mouse became available as part of the third week of the Great Winter Hunt 2014. 13 December 2016: The points/gold for Miser Mouse were changed. This page was last edited on 18 December 2017, at 16:59.